Never Pay Another Late Payment Penalty – I have to admit, about 3 years ago, I was one of those 40% or so of people that didn’t live by a budget. Then again, I made good money and, didn’t have very much to show for it. One place a lot of my extra money was going was late payment fees on at least 2 or 3 bills a month. We all have monthly bills. It seems like none of our bills are due on the same day and, the truth is, it’s hard to remember due dates for everything that you pay each and every month. However, if you maintain an accurate budget, you don’t have to worry about late fees because your budget will tell you when your bills are due! Learn More About Your Debts – I thought I knew everything about my debts until I actually took the time to jot down everything I owed. It took a little while but, I scrounged up every bill in the house and made a list of all of my debts including important factors like balance payment and minimum payment. I thought I had about $2,000 less debt than I actually did…ouch! But, the good news is, seeing where I was gave me the extra push I needed to start getting aggressive with paying my debts off and, it worked! I’m closer to debt freedom today than before, that’s for sure! Get On The Fast Track To Savings Goals – By creating an effective budget, you will be sure to have an upper hand when it comes to savings. Without a budget, at the end of each pay period, I would be praying for that next pay check to come in a day early…of course that never happened! But, once I created my budget spreadsheet, I was able to clearly see what I could do to start putting more money away. For me, it was pretty clear…Budget my excess monthly funds for fun and savings instead of blowing it all on fast food, Applebee’s and the occasional drink. It might just be that simple for you too. I’ve also read a few articles that are still telling you to write your budget out. Now, that’s just the stone ages! Our computers can do so much for us when it comes to budgeting. Here are just a few of the many advantages of keeping your budget on a spreadsheet. Easily Prioritize Your Debts – Obviously, not all debts should be treated with the same priority as others. In any case, the highest interest rate debt should be paid first. By making a budget spreadsheet that includes the interest rate, you can let the computer do the sorting for you. Most spreadsheets allow you to easily sort columns and cells. Make Changes Without Making A New Sheet – In the old days of budgeting, every time something changed, we would have to write out an entirely new budgeting sheet. Not anymore! With a budget spreadsheet it’s very easy to actively make changes as your finances change. Turn Your Debt And Savings Goals Into A Game – I’ll admit, it took me a little while to really start enjoying maintaining my budget. The way I got over the instant boredom that would come as a result of me working on my budget is, I turned it into a game. Now I earn points when I reach my goals and even more when I exceed them. When I miss my goals, points are deducted. The points can mean anything to you but, for me, I just enjoy the competitive nature of the game. 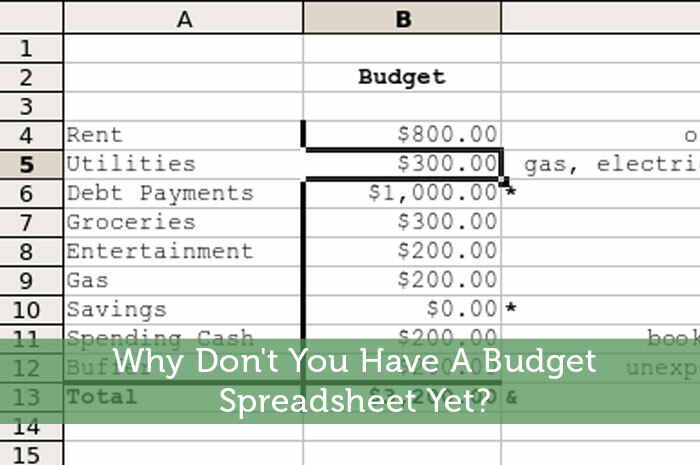 Why Don’t You Have A Budget Spreadsheet Yet? Very well put. I think that people who don’t even think they need to find places to save should make a budget. Most people will be surprised by how much they spend in certain categories — almost certainly food. Thanks for your comment Debt Blag! I really appreciate your input! You know, being in a company and watching company spreadsheets, it’s funny to me that people don’t keep personal ones. when it comes to finances, people should be keeping their personal ones like a company does (well, an honestly-run company, that is), it’s the only way to know exactly what’s happening and why, and keep on track. It seems like people get lazy when it comes to personal finances but that’s that the exact last place you should! Get those spreadsheets going and start writing down your expenses and expenditures! Hey Erin, thanks for your comment. I don’t think that it is as much laziness as it is, not knowing where to start. But, it’s definitely an important thing to do! I think spreadsheet budgets are great and afterall people who keep a budget are far more likely to succeed financially. However I’ve been a big fan of Mint.com for a long time now and it has been great for me. My problem with spreadsheet budgets is that they can take a lot more time to manage and keep up to date whereas Mint does a lot of the updating itself all I have to do is makes sure all the transactions are categorizes right and set my budget to what I want them to be. Hey Chris, thanks for your comment. Mint is definitely a great way to go but, personally, I like to keep my budget local. I guess it all boils down to user preference. I love how a spreadsheet brings all the numbers into focus and keeps categories organized. I’ve been using one for years now, so I have monthly data that goes back a long time. It’s not hard to put one together at all. Thanks for your comment! I’m glad your budget works for you and, yes, I’m a visual person as well! If I can do a spreadsheet, anyone can. It certainly makes looking at money over time much easier. Thanks for your comment and letting people know it’s simple to make the spreadsheet! You are always appreciated! Yes! I love my budget (obviously), and a quick and dirty spreadsheet is the easiest way to start! We’ve been on an excel sheet for 5 years, and I’m migrating to Mint.com for some of it to give it a shot. But the point is, plan your month out on (digital) paper before it begins, and you’ll be in a good place. Jacob, thanks for your comment! I couldn’t agree more! Great tip! I have been using a budget spreadsheet for the past 8 years to help me pay bills on time and track my savings progress. This is probably the single most important thing for me to help me save money! This budget spreadsheet is a remarkable tool. it can help consumers keep track of spending on a regular basis. It’d definitely be a lot easier if I used an online budgeting software but I much prefer a spreadsheet budget. The act of manually entering my expenses hurts a lot more than just seeing it automatically pop up on some software. It forces me to keep track of every penny I spend and think twice before spending more money than I should. I don’t know where I’d be without my budget s/s. I also have a cashflow s/s too. The thing is once you get in a rhythm, it’s not that bad, and the freedom of knowing where you stand and what you can and are doing about it is just that, freeing.